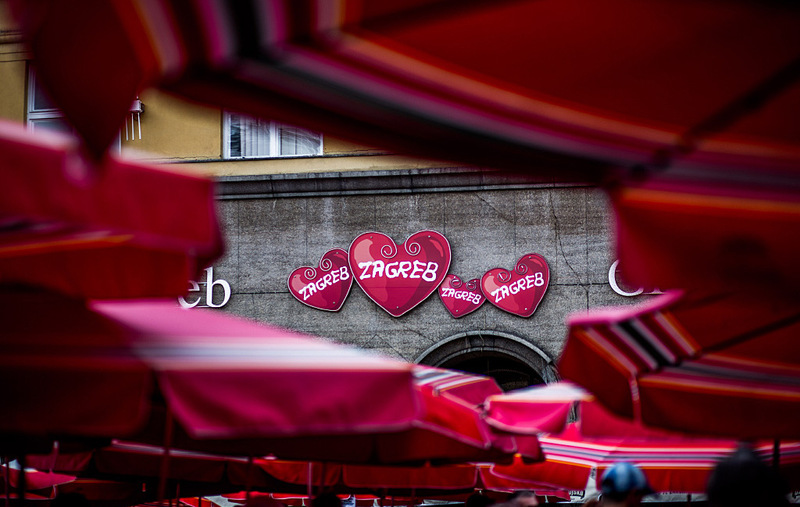 You have heard about markets in Zagreb, and as you’re walking away from the Ban Jelačić square, towards the lively Tkalčićeva street on a sunny day, you suddenly see a set of steep stairs on your right. Curiosity takes on, and after a few seconds of climbing you see dozens of red umbrellas bathing in the sun under the watchful eye of the Cathedral top. Welcome to Dolac. Should it be so noisy and vibrant? 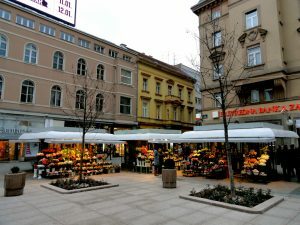 It absolutely should: this is one of the markets in Zagreb. It is worth mentioning that almost every larger neighbourhood has one market of its own, so we will mention only the ones in the City centre, within walking distance. When putting together this article, intention was to name it “Dolac market” – that’s how important this market is. Located between Upper and Lower city, Dolac truly is not only the belly, but also the living part of tradition of Zagreb, which wakes up before anyone else each morning. 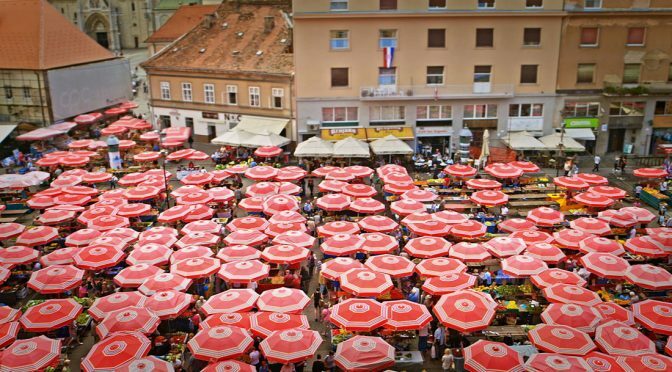 It was set up in 1930. as a place where farmers from all over Croatia offered their freshly grown products. Soon, a fish market was added to the complex offering freshwater and sea fish. It wasn’t too long before it seemed that Dolac was here forever. But the real delight of this market, without a doubt, are “kumice”. Often wearing a scarf around their heads, these ladies are a symbol of trading in Zagreb. And trust us when we say that their unique approach and the ingredients they sell will not leave you indifferent. So if you’re looking to avoid shops and excited to try home-grown fruits and vegetables, this is the place. The fish market is an excellent place to get familiar with delicious Adriatic fish, having in mind that Mondays should usually be avoided when looking for fresh fish. 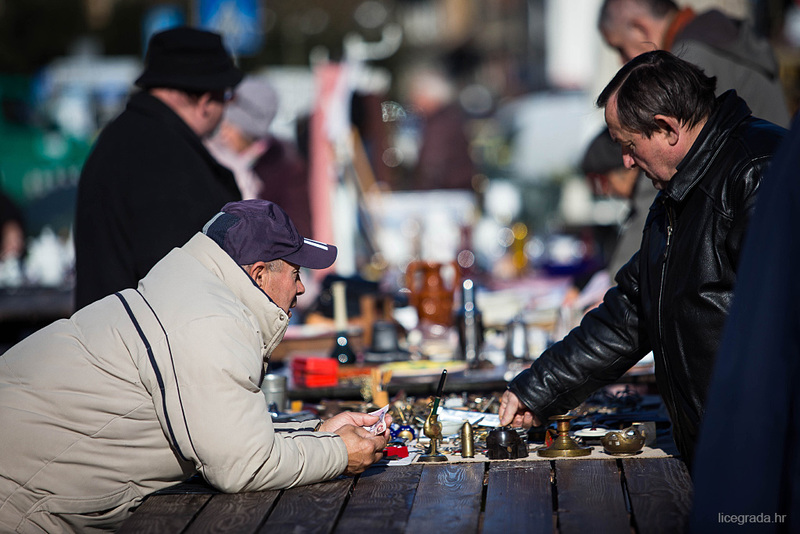 Flea market on the British square takes place on Sundays, and features a broad range of antiquities offered. This place is perfect for enthusiasts searching for unique items from different period of times, with some of the items ranging from time before the WWI. Event like this also gives you a glimpse of the past, as interesting and turbulent as Croatian history is. Extraordinary vases, cutlery, plates and even distinguished clothing can be found here. Prices are negotiable. And on Thursdays, this picturesque square transforms into a book market. What can be crucial on markets like this is timing. Many on the offering side are first-time sellers, and as such, they tend to come earlier than others. When they sell something valuable, it’s not too long before it’s sold, so being here on time gives you a bigger picture. Want to meet some people, or grab a coffee in a crowded place full of stories? Look no further, this is the Flower Square on weekends. As a market, it features only a few stands with flowers, with no food options. Although it would hardly qualify for a market, it is definitely worth a visit, because it is yet another glimpse of history, where some time ago stood a real farmer’s market. Buy some home-grown flowers and continue exploring the city, as it will add some spice on top of it all. Previous PostNew Zagreb Airport openedNext PostAdvent in Zagreb 2017./18.